Although stress is a natural part of life, it can be a major problem if it is prolonged or severe. In our frantic society, stress affects people of all ages, gender, and circumstances. Stress can lead to both physical and psychological health issues. 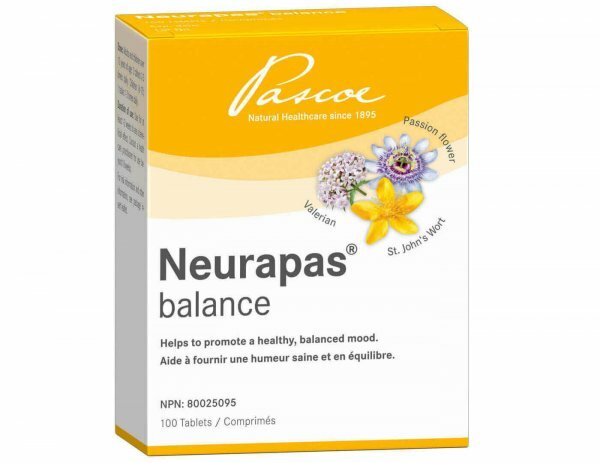 Pascoe is here to help with Neurapas Balance: for a healthy, balanced mood. Neurapas is made with a triple herbal combination of naturally sourced medicinal ingredients: dry extract of passionflower, valerian root, and st. johns wort. As a herbal product, Neurapas has no addiction potential and no hang-over effect. Neurapas affects the GABA, as well as serotonin neurotransmission to help promote a healthy and balanced mood. Take Neurapas consistently for 4 weeks to see optimal results. To keep your mind healthy, it is also important to take care of your body. The way you eat, sleep, and stay active can have a big effect on your mental health. Lifestyle changes are simple but powerful tools in treating mental disorders. Sometimes it might be all you need. Get physical - Regular, moderate exercise helps ease tension, lift mood, and improve sleep and self-esteem. Making exercise a habit is key. Get enough rest - Getting enough sleep can improve mood, concentration, and performance at work or school. Eat right - A varied and balanced diet provides fuel for your brain and counteracts the impact of stress on your body. Get a dose of sunshine every day - Sunshine lifts your mood. Try to get 10 -15 minutes of sun exposure every day. Get a pet - Pets can be great companions, as well as give you unconditional and uncomplicated love. Mental illnesses are very common and are among the leading causes of disability in Canada. They not only lower your quality of life but also impact those you love. Many people now choose to use natural therapies to help them with mental health problems. These therapies can be less intrusive than medical treatments. Most of them can be used alone or with other medications. Work together with your healthcare provider and choose the best therapy for your unique situation. Neurapas® balance is the premier formula from PASCOE - a German company with 120 years of history in Natural Medicine. Neurapas® balance is made in Germany and is authorized for sale by Health Canada as a natural health product. Neurapas® balance was awarded the SELF Deutschland-Award by the European League for Safe Patient Therapy Self-Management. Dimpfel et al. (2011) Early effect of NEURAPAS® balance on current source density (CSD) of human EEG. BMC Psychiatry 11:123-137. McGregor et al. (2006) Triple combination in NEURAPAS® balance demonstrates a unique effect on sleep EEGs. Acta Biologica 1:3-14. Trompetter et al. (2013) Herbal triplet in treatment of nervous agitation in children. Wien Med Wochenschr 163:52-57. Non medicinal ingredients: lactose monohydrate, liquid glucose, maltodextrin, silica, talc, magnesium stearate providone, glycerol, Eudragit-E, titanium dioxide (E171) indigo carmine (E132) macrogol 6000, croscarmellose sodium. Adults, children (>12 years): 2 tablets 2-3 times daily. Children (6-12 years): 1 tablet 1-3 times daily. Tablets should be swallowed whole with a little water. Film Tablets. Active ingredients: Dry extract of St. John’s wort , dry extract of valerian root, dry extract of passion flower herb. Indications: helps to promote a healthy balanced mood. This product has helped me so much. Ever since my ND prescribed this to me, my mood has gotten so much better. Don't get me wrong, I still have some bad days, but I don't wake up with a constant feeling of dread or anxiety. If something bad happens to me, it only affects me for 5 minutes, and I put the thought away. No more constantly thinking about what happened. Neurapas has really helped my mental health and mood improve. I have personally struggled with low mood and anxiety throughout my early adult hood. After reviewing some of the blogs and research I saw online, I thought I would give Neurapas a try. Surprisingly I saw improvements with my mood and anxiety about after 2 weeks (taking 2 per day). I think this is a good option for me as I always felt I was “in between” and wanted to try a natural approach first. I started taking this supplement in order to manage symptoms of depression and anxiety associated with stress and perimenopause. I noticed a shift in my mood immediately and a significant improvement in my ability to fall asleep and the overall quality of my sleep. My mood has improved and I feel more positive, less anxious, and more resilient. I have tried other natural products in the past that were okay, but Neuropas is excellent. It has improved the quality of my life considerably. Thank you! I've seen some great results with this product in just a little over 2 months. I love the how this product contains only 3 ingredients; it is very simple and effective. I'll definitely be prescribing this to my patients in the future! Prescription drugs did not help me so I tried this. It works right away. Amazing! If you have depression and/or anxiety, but do not want to go on prescription medications because of the side effects or you just prefer a more natural path, Neurapas is an option. Definitely talk to your family doctor and/or a naturopathic doctor first; but take it from someone who wasn’t given the choice (because I was underage), Neurapas is one of the natural options out there. I like this product because it helps me cope with the stress of everyday life. It doesn't make me feel weird or anxious, probably because it's natural. It does take a bit of time to fully work properly, but once it works you feel great! I was taking escitalopram for years and finally came off of it when I thought I was better. Then I slumped again. I wanted to try something new, something more natural. When I heard about Neurapas I was excited about the idea of something plant based, but I have to admit I was a bit skeptical. I tried Neurapas and after 2 weeks I noticed a HUGE difference in my mood, my outlook, and my overall perception of life. I feel I can better handle stress and anxiety now, and I don't feel bad because the product is natural. I am thankful for finding Neurapas and will continue to use it as needed. I feel better about the fact that it is a better alternative to the chemicals I was taking before. Great format of just enough text fo rindications and about company. I am intrigued by the speed your company has move forward with the new concept. I love the colors you are using, so positive. I am happy about the new marketing concept, reaching out to potential customers. Thank you for your kind feedback! We love that you are enjoying the new site.